Presbyopia, according to the Mayo Clinic, is the gradual loss of the eye's ability to focus on nearby objects. When spectacles were first invented they helped improve one's overall vision. However those who developed presbyopia were forced to continuously wear their spectacles when viewing nearby objects and removing them when they weren't. This inconvenience introduced a new problem, a problem that many believe was resolved by Benjamin Franklin with the invention of split bifocal lenses. Benjamin Franklin was well known for being a prolific writer, politician and scientist, but many also credit him for playing a critical role in the field of optics. In 1779, while on a diplomatic visit to France it is documented that he ordered a special lens to be manufactured with unconventional specifications. In fact, during the lens cutting process they broke three times. 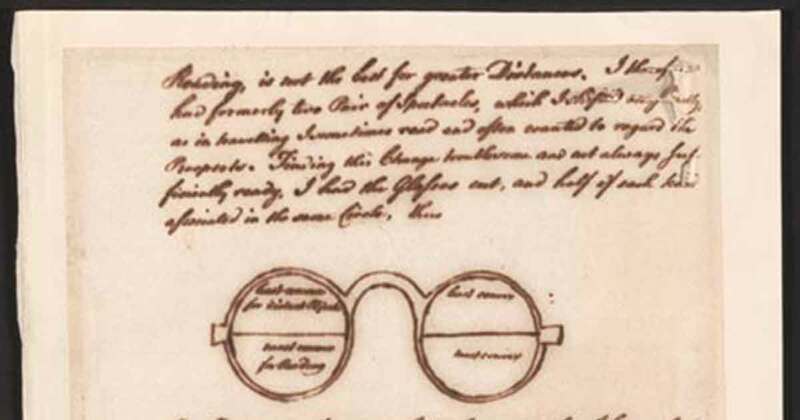 In 1784, Franklin wrote a letter to a friend declaring himself "happy in the invention of double spectacles, which serving for distant object as well as near ones, make my eyes as useful to me as ever they were". 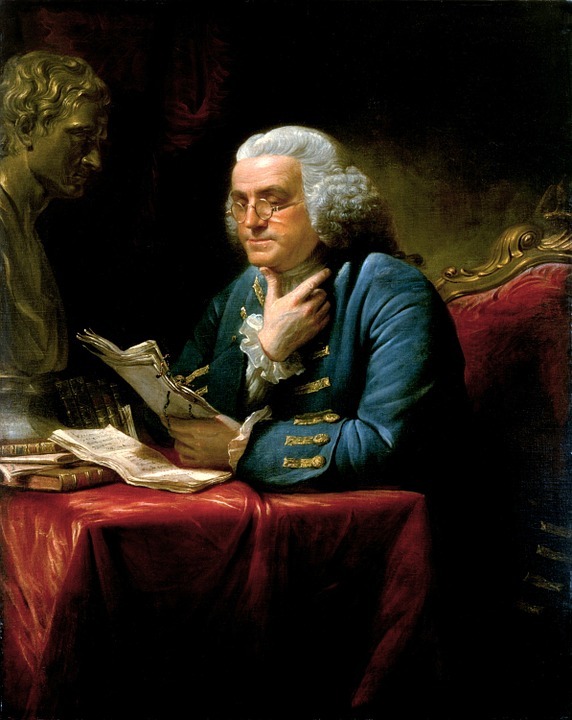 Double spectacles, as Benjamin Franklin called them, are in fact referred to as bifocal lenses today. The manufacturing of bifocal lenses include two lens powers, with the bottom portion of the bifocal lens used to addresses issues focusing on near object, while the other lens provides vision correction for distant objects. Today the lens devoted to near vision can come in various shapes ranging from half moon, round, to a full bottom half, also appropriately named as the Franklin. Albeit there are many that believe Benjamin Franklin invented the bifocal lenses there are equally as many that believe that he was only the first to introduce them to North America. In fact, many attribute the idea of split spectacles to individuals from both Britain and the US, despite the fact they were never patented by Franklin or anyone else. 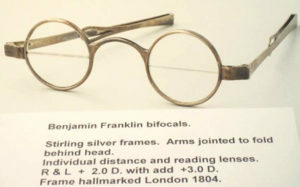 Although Benjamin Franklin cannot be definitively validated as the inventor of the bifocal lens there is no denying his impact in introducing them to the public. Actually greater public awareness of this lens started to gain traction in the early 1790s following Franklin's death. Benjamin Franklin's impact on optometry is usually overshadowed by many of his other accomplishments and roles in science and politics, however there is no denying that his impact on the optical field played a vital role in the advancement of optometry.